Please read these terms and conditions carefully because they govern your use of the New Hampshire Businesses for Social Responsibility (NHBSR) web site (the "Site") and the information found through the use of the Site. Although NHBSR has attempted to provide accurate information on the Web Site, NHBSR assumes no responsibility for the accuracy of the information. NHBSR may change the programs or products mentioned at any time without notice. Mention of third party products or services is for information purposes only and constitutes neither an endorsement nor a recommendation. ALL INFORMATION PROVIDED ON THIS WEB SITE IS PROVIDED "AS IS" WITHOUT WARRANTY OF ANY KIND, EITHER EXPRESSED OR IMPLIED. NHBSR AND ITS SUPPLIERS DISCLAIM ALL WARRANTIES, EXPRESSED OR IMPLIED, INCLUDING, WITHOUT LIMITATION, THOSE OF MERCHANTABILITY, FITNESS FOR A PARTICULAR PURPOSE AND NON INFRINGEMENT OR ARISING FROM A COURSE OF DEALING, USAGE, OR TRADE PRACTICE. NHBSR SHALL NOT BE LIABLE FOR ANY INDIRECT, SPECIAL, CONSEQUENTIAL, OR INCIDENTAL DAMAGES INCLUDING, WITHOUT LIMITATION, LOST PROFITS OR REVENUES, COSTS OF REPLACEMENT GOODS, LOSS OR DAMAGE TO DATA ARISING OUT OF THE USE OR INABILITY TO USE THIS WEB SITE, ANY OTHER HYPERLINKED WEB SITE, DAMAGES RESULTING FROM USE OF OR RELIANCE ON THE INFORMATION PRESENTED, EVEN IF NHBSR HAS BEEN ADVISED OF THE POSSIBILITY OF SUCH DAMAGES. This Web Site may contain links to third party sites. Access to any other Internet site linked to this Web Site is at the user's own risk and NHBSR is not responsible for the accuracy or reliability of any information, data, opinions, advice or statements made on these sites. NHBSR provides these links merely as a convenience and the inclusion of such links does not imply an endorsement. Groups who link to NHBSR's web site without clear evidence of intent will be directed to remove the link. Groups who present a link to the NHBSR site in any way that suggests NHBSR has any relationship or affiliation with your site or endorses, sponsors or recommends the information, products or services on your site will be directed to remove the link. NHBSR reserves the right to request removal of any link it deems misrepresentative or offensive at any time. 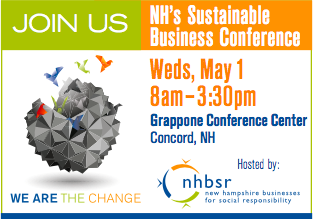 NHBSR is the trademark of New Hampshire Businesses for Social Responsibility. All other trademarks appearing on the Site are owned by their respective companies. All text, graphics, logos, button icons, images, audio clips, software and other information and materials ("Content"), included on or provided through the Site are and will remain the sole and exclusive property of NHBSR and are protected by United States and international copyright laws. The compilation (meaning the collection, arrangement and assembly) of all Content on the Site is the exclusive property of NHBSR and is protected by U.S. and international copyright laws. Copyright to all Content included on the Site is held by NHBSR or its licensees. No information may be submitted to NHBSR by persons under the age of 18 without the consent of a parent or legal guardian, nor may persons under the age of 18 make purchases or other legal acts on this site without such consent.